The process to perfect these beauties took much longer than expected. One day I will get them to look picture perfect, but the taste is sure there. 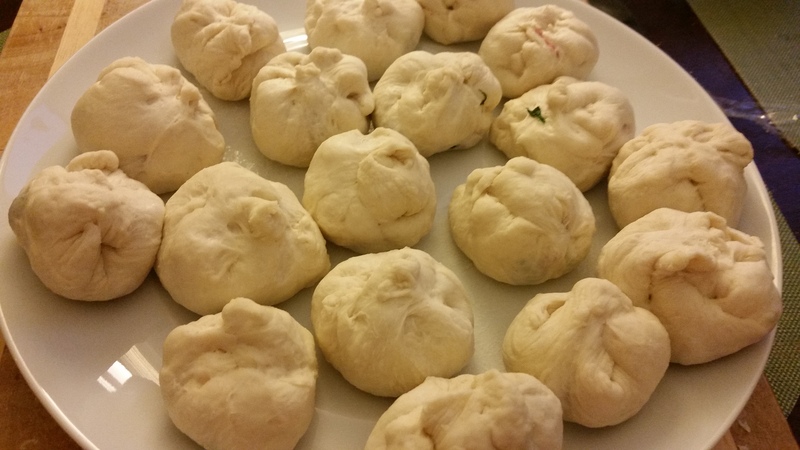 To review, the dough for steamed pork buns is the same I used for the scallion pancakes: frozen bread dough. Can you believe that? Sometimes the things that seem complicated on the outside are, in reality, quite simple when you delve into the process. In my first experiment, I cut one loaf of frozen bread dough into small pieces and used flour to roll those pieces into balls to then flatten them out into medallions. 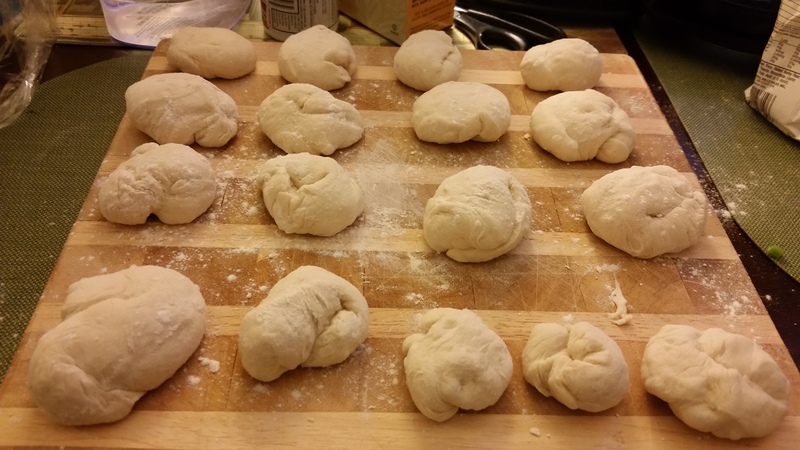 Unfortunately, the flour made the dough less adhesive, and the pork buns opened up while cooking in the steam. Water got into some of them. It was kind of ugly. Nevertheless, some of them survived, and the filling was juicy with the right flavors. I cut out flour in my second experiment, letting the dough be pliable and sticky so that the folds stuck together and wouldn’t open in the steam. This post is proof that success was had! 1. Start by making the filling. Take your ground pork and put it in a medium-large mixing bowl. 2. Chop the scallions, defrosted spinach (or sautéed and cooled spinach), and fresh ginger. Add that to the mixing bowl. 4. Add the sherry, sesame oil, egg, and spices (salt, pepper, and Hondashi if you have it). In this step, add as much liquid as you need in order to make the mixture sticky. You don’t want it too thin (too much liquid/oil) or too dry (not enough). 5. Take your hands (or a fork if it grosses you out, but using your hands is so much fun!) and mix the filling together, making sure all ingredients are evenly incorporated. Wash your hands and set aside. 6. Thaw loaf of frozen bread dough according to package instructions. 7. With a serrated knife, cut the bread dough into small strips about 1 inch wide. 8. Roll each strip of bread dough into a ball. Set each ball of dough on your cutting board. It’s going to be sticky, but that’s what you want so the bun folds well! 9. Take one ball of bread dough and roll it out into a medallion a little over a quarter-inch thick. If you don’t have a rolling pin, you can flatten it with your hands. 10. Place a small portion of your filling in the center. 11. 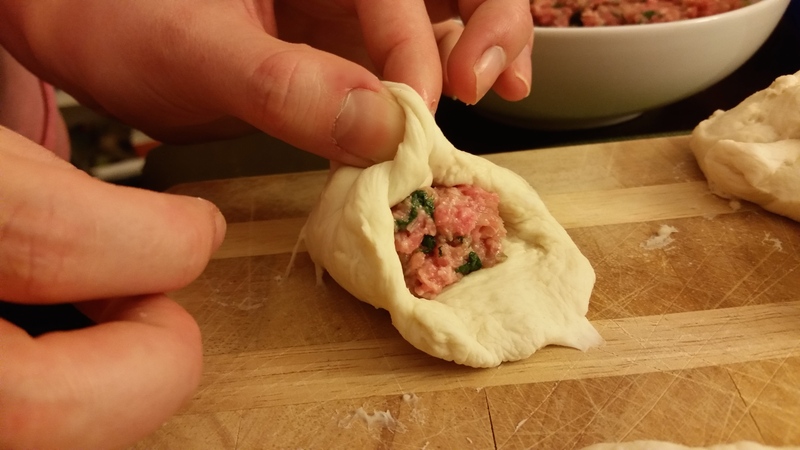 Now, to fold the pork buns, lift up one edge of the medallion with your thumb and pointer finger towards the center. With your other hand, take the edge to the right and have that meet the first. It’s hard to explain in writing, but think about the crimping process for pie crust. Keep taking small portions of the edge and folding them up to meet in the center. 12. Once all the edges are folded into the center, twist the dough on top so there is no chance of it opening in the steam. 13. You will need a large pan with a lid to cook the steam buns. The process is the same as making scallion pancakes. Turn the heat up to medium-high. Coat the bottom of the pan with olive oil and place the pork buns into the pan. 14. Pour water into the pan so that the buns are about halfway submerged. 15. Cover the pan and allow the pork buns to steam in the boiling water. 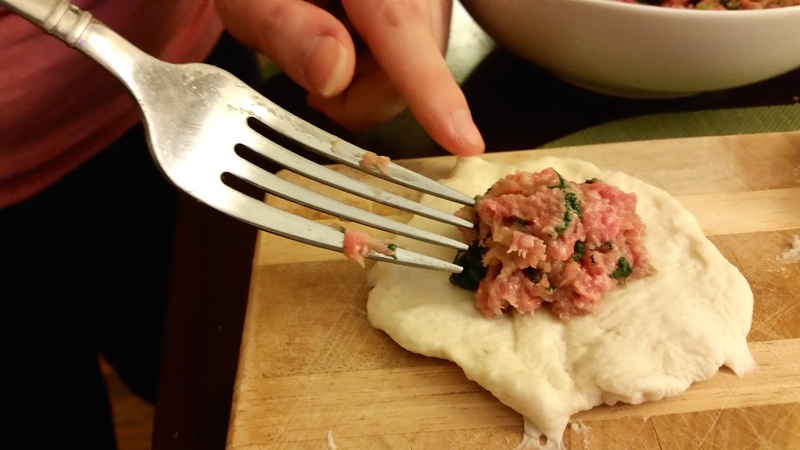 The pork buns will grow in size, don’t be alarmed! 16. Once you see that the water is about evaporated, turn the heat down to low and let the pork buns brown on the bottom. Some may have already browned before you turn the heat down. Just check each bun using a pair of tongs and cook accordingly. 17. 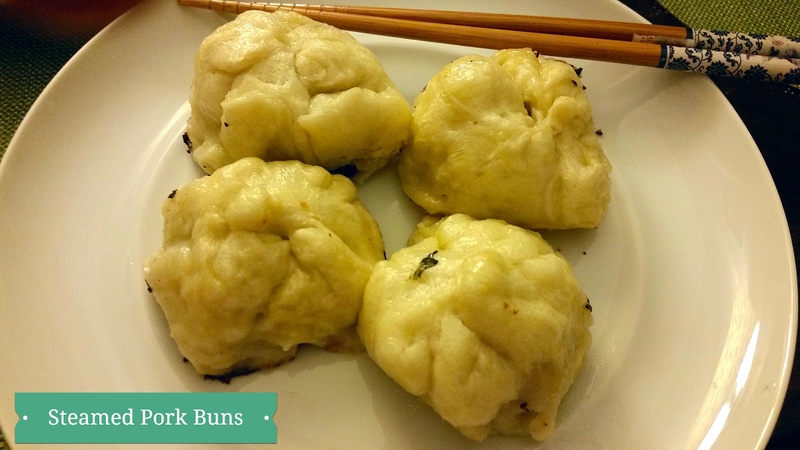 When the pork buns are browned on the bottom, they are ready to eat. A crispy bottom with a little char is perfect. You can dip the pork buns in soy sauce or in a Chinese vinegar. Bailey’s family uses Zhenjiang vinegar. Another fact that is good to know – this filling can be used in wontons to make wonton soup. Genius. Please let me know if you have any questions about the process of making these, especially when it comes to folding them!